Today we’re excited to announce that we’re partnering with Sold Out to bring The Escapists 2 on Nintendo Switch to retail with a physical launch on October 30th 2018! It’s time to escape again, inmates! Escape by yourself, or with up to three friends locally or online in The Escapists 2. Team up and bust out with another inmate by taking a Joy-Con each in local two-player split-screen mode, or unite with up to three friends to create the ultimate online escape crew in the biggest prisons yet! Create your con! Choose from a massive array of customisations to make your character unique to you. It’s important to look stylish whilst you mastermind your escape! Craft your escape! Combine everyday objects like soap and socks to craft new weapons and tools to help you achieve your goal. Steal forks from the cafeteria to chip a tunnel in your room, and use duct tape to hide the evidence. You’ll soon learn that duct tape solves (almost) everything! Escape team, assemble! Engineer the wildest escapes yet by uniting with up to three friends and creating the ultimate online escape crew! Work together to create even more elaborate and daring plans. Or take a Joy-Con each in local two-player split-screen mode! Feeling competitive? Dive into the versus mode and show that you’ve got the skills to breakout of prison faster than your friends. If all else fails, settle your rivalry in the courtyard with a prison punch up! 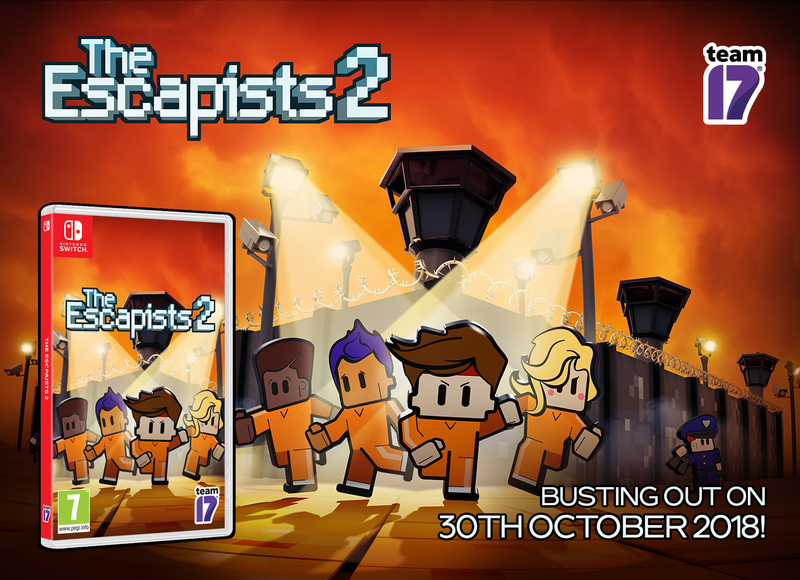 The Escapists 2 is available now digitally on Nintendo Switch via Nintendo eShop, Xbox One, PlayStation 4 and Steam, and will be available physically on October 30th 2018. For pricing and availability, please check with your retailer.